A thoughtful friend is to be appreciated and remembered. 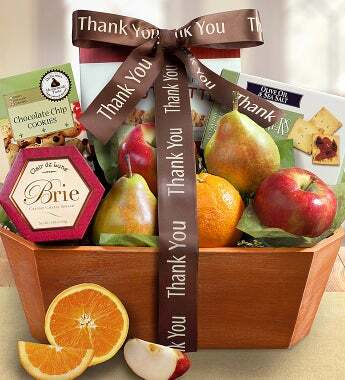 Say Thanks with this gourmet thank you gift basket full of mouthwatering fruit and delectable snacks. The food experts at The Fruit Tree™ have paired fresh-from-the-tree fruits like seasonal pears and crisp apples, with complementing Brie creamy cheese spread, Old Dominion® peanut brittle and Partners® Olive oil & Sea Salt Crackers.